Falls are the leading cause of injury for older Americans. See these prevention tips. In 2013, there were 44.7 million Americans age 65 and older. As the baby boomer generation ages, that number will spike upwards to 56.4 million in 2020, 82.3 million in 2040 and 98.2 million in 2060. Most baby boomers will live longer on average than previous generations, and will hope to remain independent and age gracefully, which makes “aging in place” (living at home as long as possible) an attractive option. But several studies suggest that most homes aren’t designed to minimize safety risks for people over age 65. 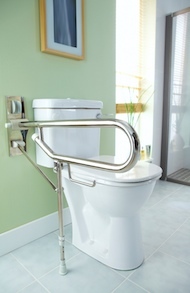 Install grab rails near the toilet and in showers. 1. Keep Emergency Numbers Handy. Always keep a list of emergency numbers by each phone and write them big enough to read easily if in a hurry or frightened. Be sure to include numbers for the poison control center, fire and police departments, family members and the family doctor. 2. Prevent Falls. 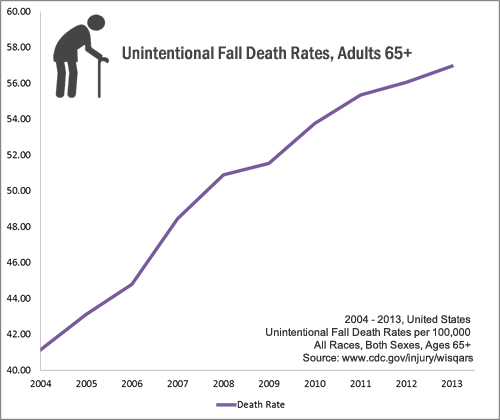 The Centers for Disease Control and Prevention reports that falls are the leading cause of injury for older Americans. Every 13 seconds a fall-related injury is treated in an emergency room and every 20 minutes someone dies from a fall. To prevent falls, make sure all hallways, stairs and paths are well-lit and clear of objects, use rails and banisters when taking the stairs, and tape all area rugs and cords to the floor so they don’t move. Also consider a wearable alert system that allows a senior who has fallen to summon emergency personnel. Download this step-by-step fall prevention checklist. 3. Protect Against Fire and Related Dangers. Older adults are at greater risk of dying in a home fire. They may move more slowly or have trouble hearing a smoke alarm. Smoking is the leading cause of fire deaths, so try to smoke outside and never in bed. Make sure there is a LOUD, working smoke alarm on every level of the house, in bedrooms and outside of sleeping areas. Download this tip sheet from the U.S. Fire Administration for additional information. 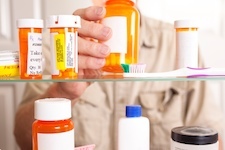 Storage areas for medications should be well-lit and labels printed in oversized type. 4. Avoid Bathroom Hazards. Bathrooms are especially hazardous for older adults, accounting for 80 percent of all falls according to the National Institute on Aging. They have slippery and unforgiving floor surfaces, and few sturdy handholds. Install grab bars in the shower and near the toilet. Put rubber mats in the bathtub. And consider setting the water heater thermostat no higher than 120 F to prevent scalding. Consumer Affairs has a number of additional tips for making bathrooms safe for seniors. 5. Prevent Poisoning. The risk for a medication mistake increases as we age. According to 2014 Medicare records, there are more than half a million drug-related injuries that occur at home every year. Mistakes can include taking too much medication, taking the wrong medication or incorrectly mixing two or more medications. To prevent accidental poisoning, keep all medications in original containers to avoid mix-ups, and store medications in a well-lit room so the labels are easier to read. Ask the pharmacy to put large-print labels on prescriptions. And bring all pill bottles to doctor appointments to ensure medications are being taken correctly. 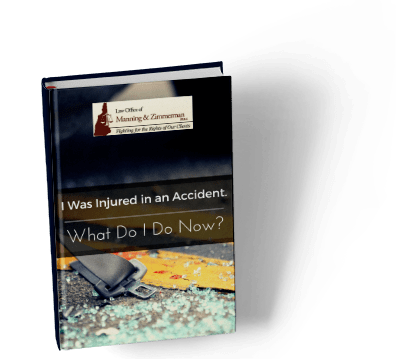 To contact the Law Office of Manning & Zimmerman PLLC, call (603) 624-7200 or send us a message to info@manningzimmermanlaw.com.